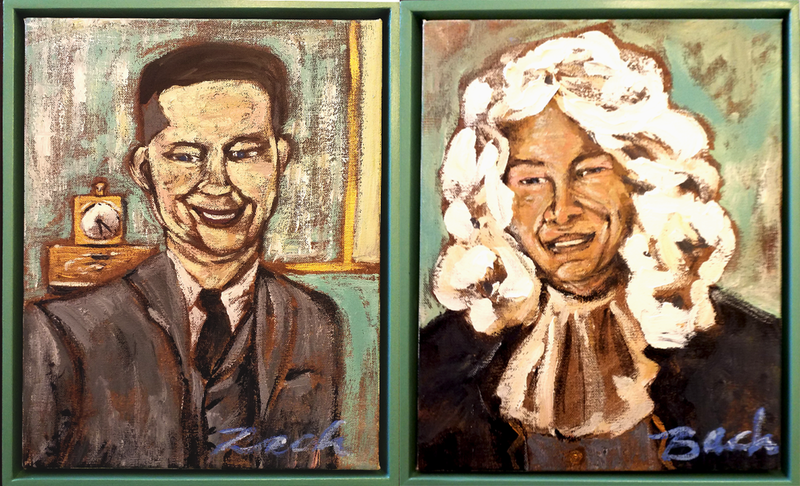 Amanda Talley made these wonderful paintings to comemerate our Rach & Bach Concert for the 100th Anniversary of the ESU! ANOTHER BRILLIANT DONGIEUX FOR RACH AND BACH! I met young Gunner Dongieux when he was only 5 years old. His father married my good friend Pam Georges. Even as a young child he showed a fondness for art. He attended NOCCA (The New Orleans Center for Creative Arts) and then received scholarship to study art at Stanford University. Needless to say we are all proud of Gunner Dongieux. We asked him to create a piece of art for Rach and Bach. He decided on a collage and also figured out a way to include one of his icons, Marilyn Monroe. Turns out that Marilyn stars in “The Seven Year Itch,” which contains a scene where Marilyn hangs out at the piano while Rachmaninoff’s first movement of the 2nd piano concerto is being played in the background. 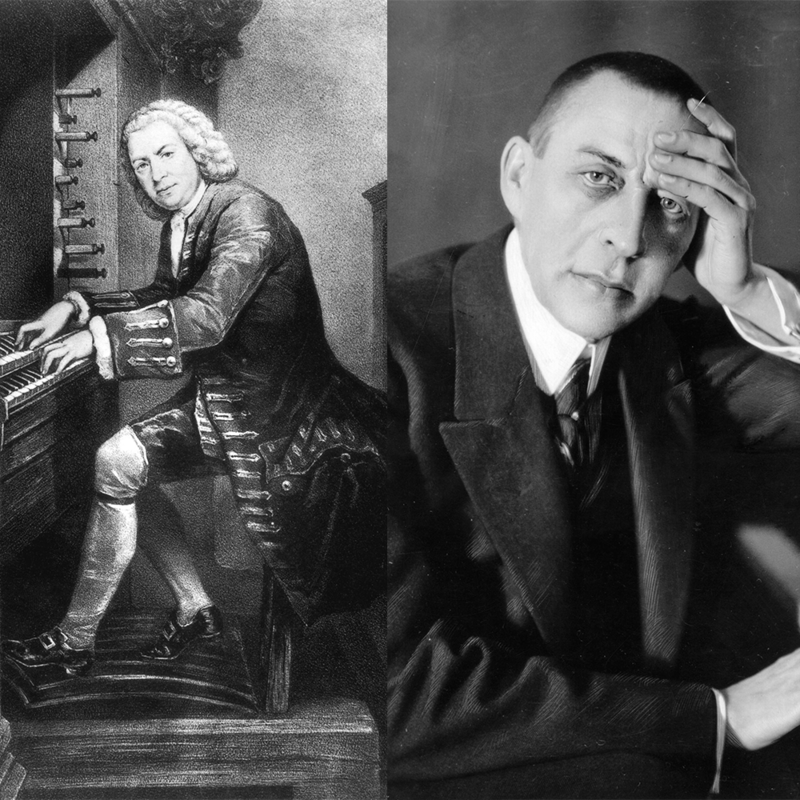 Gunner decided to use an image of our music room and put me dressed in that damn wig which will forever haunt me and Quinn dressed in his dinner jacket sporting short hair in the style of Rachmaninoff. Marilyn is standing beside us in the same dress she wears in the movie. Check out the scene from the movie below. RACH & BACH MIXED MEDIA! This is a mixed media oil and glitter painting by Heidi Hayne, an Art and Religious Studies major at Sewanee University of the South. "The inspiration for this painting came from a conversation at dinner with Quinn and Michael when Quinn spoke of Rachmaninoff’s use of hypnosis therapy to compose his Concerto No. 2. Here, a play on the words “Rach and Bach” is illustrated by having Bach (Michael Harold) dressed up a rock n’ roll star playing the piano guitar in Rachmaninoff’s (Quinn Peeper) hypnotic crystal ball. "The glitz and glam of the painting reflect the fun and intriguing nature of Michael and Quinn and their love for music!" ~Heidi Come to Rach & Bach Gala Benefit Concert! DANCING ALL THE WAY FROM GREAT BRITAIN! We used to stay at a friend’s house in New York who always lit these intoxicatingly fragrant candles Each candle also contains its iconic label in gold. I finally had to turn the candle over to find out the name. It’s Cire Trudon. The candles are incredible. We have one in our foyer right next to the hall chair that is covered in a fabric containing a glorious monogram from New Orleans based, Leontine Linens. The candle company, Maison Trudon, hired Lawrence Mynott to create an original drawing for each one of the fragrances in the candle line. He graduated from Chelsea School of Art and The Royal College of Art. He has won numerous awards and continues to create whimsical and fantastic illustrations. His client list includes major advertising agencies, design groups, newspapers and magazines. He has provided illustrations for Penguin Books and Tatler Magazine. He lives with his wife in Tangier. Quinn managed to find his email and wrote to him to see if he would do something for the “Rach and Bach” concert. He agreed! We love the final rendition which depicts Rachmaninoff and Bach on stage as two dancing metronomes. Now, the icing on the cake would be to visit Tangier and see Lawrence’s rooftop apartment. Maybe one day…. Quinn’s aunt, Vicki Speck, lives in Little Rock and is married to his mother’s brother, Vin Speck. Vicki recently retired as a speech therapist but painted all of her life. Quinn asked her to paint a painting based on Bach and Rachmaninoff fighting over the baby piano. Natalie Wagner Phillips takes incredible photographs and used her house as a studio. Some beautiful Greek icons by Gunner Dongieux! He was a high school junior when Quinn and Michael commissioned them, today he's a sophomore at Stanford University, even leading his own class in curation! Bravo, Gunner! Come to the Rach & Bach Gala Benefit Concert! I was 21 years old. It is in April of 1986 in Paris, Spring! New Orleans Recreational Department. Every year the non-profit group held a concerto competition where students had to compete before judges. Winners from grammar school, middle school, high school and college were given the chance to play their pieces with a volunteer orchestra. 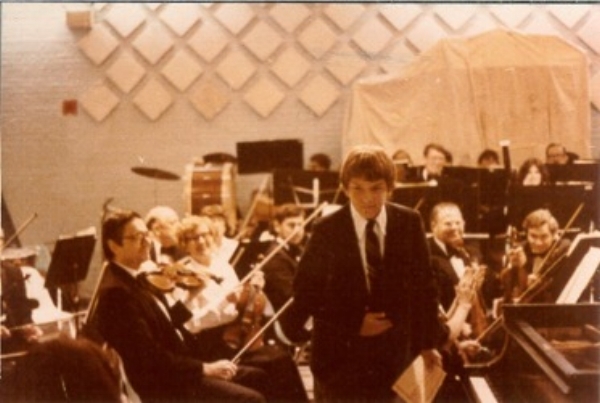 Here I am in 8th grade playing a movement from a Haydn piano concerto. 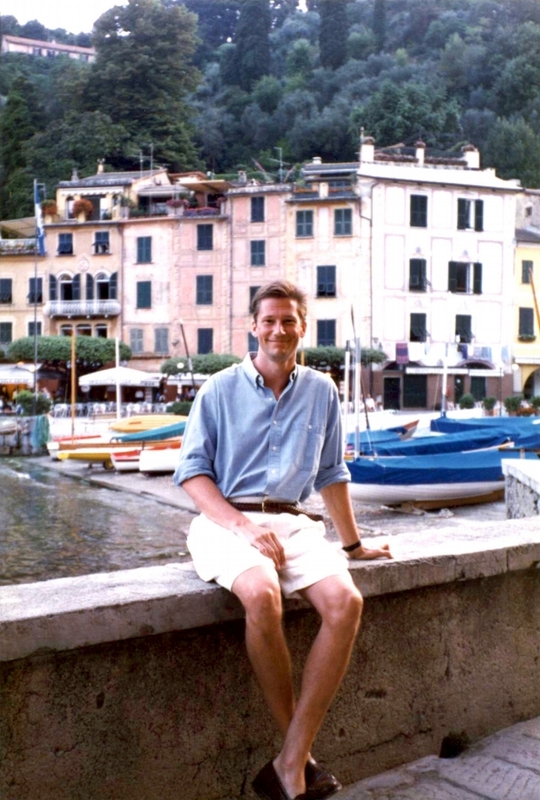 Me in 1991 in Portofino, Italy - I was a second year resident at New York Hospital. I won first prize at the twenty-sixth annual International Piano Competition at the Giornate Musicali Festival in Italy. I played Beethoven’s “Appassionata” Sonata. I chose a challenging program, to say the least. Today, Southwestern at Memphis is now known as Rhodes College. St. Benedict at Auburndale High School in Cordova, TN - My graduation was in 1978, here pictured with my friend Anne Daniel. I was valedictorian. It was a few days after my high school recital at Southwestern at Memphis, now Rhodes College. I, too, was obsessed with music as a child. My mother’s Hi-Fi was a gift from her parents in 1957 and was pricey so it was a Christmas and 16th Birthday gift. According to my mother, “It was a piece of furniture.” As a child, my mother listened to a lot of jazz; Stan Kenton, Billie Holiday, Dave Brubeck, Erroll Garner. She played the piano and hummed off key. My brother Cade always loved to get in on the act.